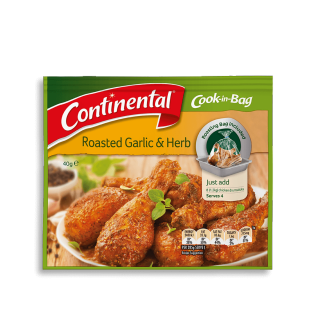 Use Continental's Cook in Bag to create a succulent roast garlic & herb chicken dinner for the entire family. Learn how to make this fast & simple dish today. Maltodextrin (from wheat), corn starch, garlic (20%), herbs (8%) (parsley, oregano), salt, sugar, natural flavours, spices (paprika, pepper), burnt sugar, vegetable gum (xanthan), sunflower oil. Allergens:Contains wheat products. Made on equipment that also processes products containing milk, soybean, peanut, sesame, egg, fish and crustacea. Step 1. MAKE IT: Preheat oven to 180'C. Place chicken drumsticks into roasting bag. Step 2. MIX IT: Add Recipe Base and close bag using included tie. Gently rotate bag to coat evenly. Step 3. BAKE IT: Place on oven tray, in a single layer. Pierce top of bag 4-5 times with a skewer to vent. Cook for 50 minutes on lower rack of oven, allowing enough room for bag to expand (bag must not touch sides or top of oven). When cooked, cut bag open (be careful, the steam will be very hot) and check chicken is cooked through. A family favourite, our Garlic & Herb Alfredo Recipe with Chicken & Spinach is a quick and tasty meal, ready in just 20 minutes. Serves 3-4. Hi, this should still be ranged in Woolworths stores. Did you want to check with their helpdesk for availability? Their number is 1300 767 969.